Any landing page built on our builder can be published as a sub-domain of sunnylandingpages.com. 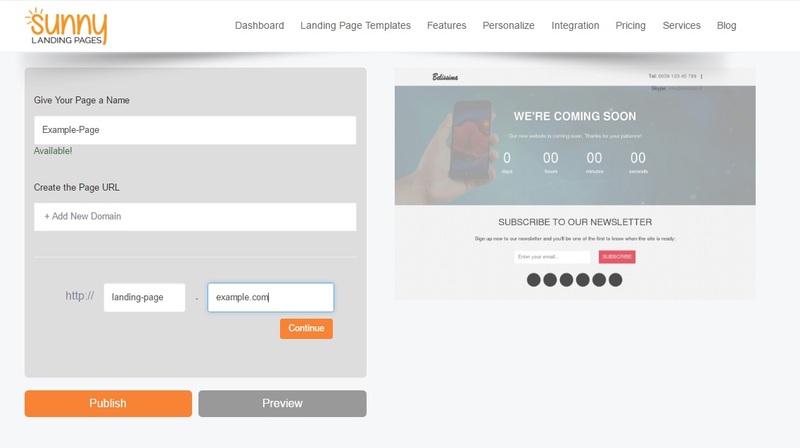 So, your page could look like landing-page-example.sunnylandingpages.com. A more professional-looking option is to publish the landing page on your own domain name so that your visitors consider the page to be a natural extension to your website. Here’s a step by step instruction on how to go about doing this. Step 1: Once you’ve completed designing your page click on Publish. You will see a pop-up like the one below and select the domain option with the WWW icon. 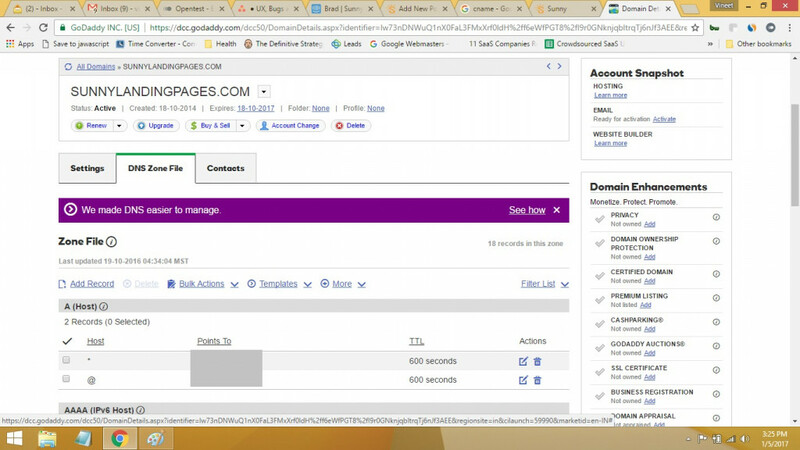 Under Create the Page URL – Select the option for Add a New Domain. You then have to create a sub-domain. Perhaps you could call it landing-page and then enter the domain name which you own example.com. In case you don’t want a sub-domain in the URL, just put in www instead of landing-page. 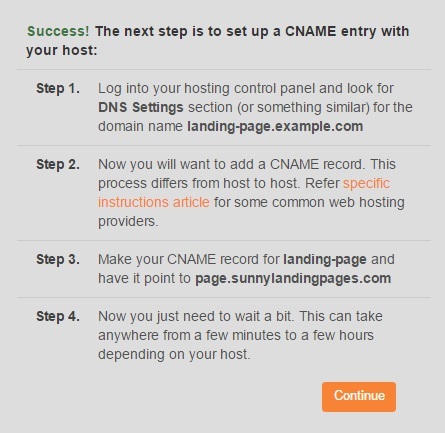 You will then see the set of instructions on how to set up a CNAME entry with your web-host. Now, here’s how the screen would look on GoDaddy. Every provider offers this feature and would look pretty similar. Click on Add Record and then select CNAME. 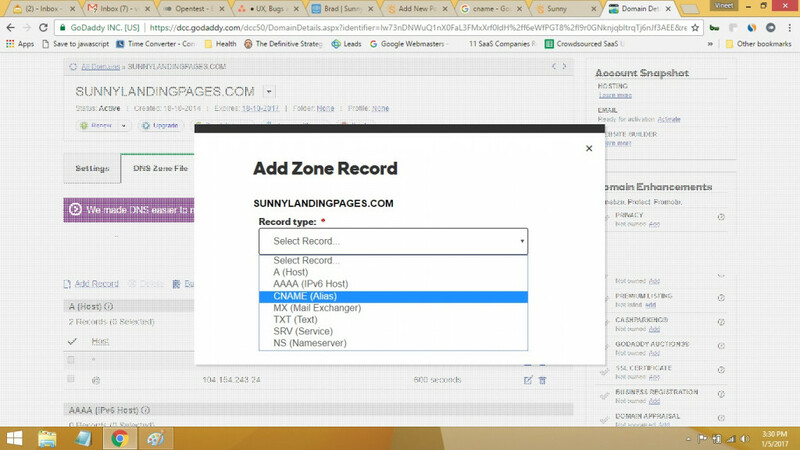 In Host, enter the sub-domain you chose on Sunny Landing Page. In this case we had said ‘landing-page’. 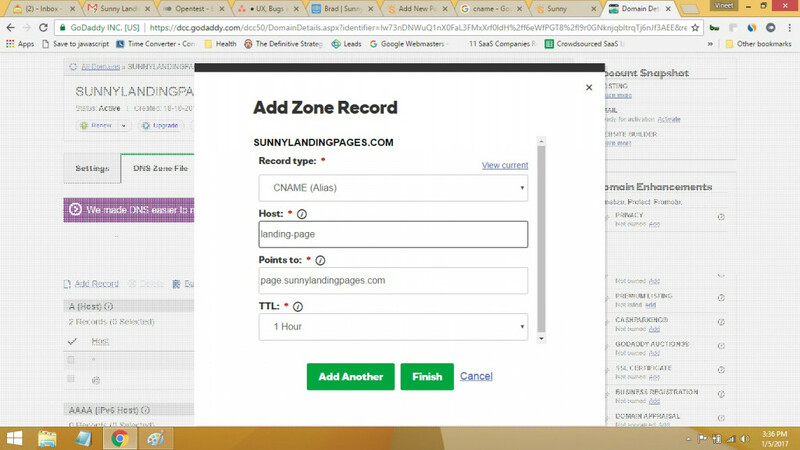 Then, in the ‘Points to’ field you always need to enter page.sunnylandingpages.com so that GoDaddy knows that this sub-domain should point to our server. You can reduce the TTL as much as possible. This will help the new URL propagate quicker and you should see the new URL working sooner. That’s about it. Check back after the TTL specified time to make sure the new URL is working.